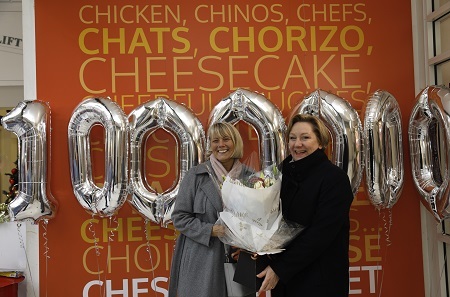 Chester's Indoor Market welcomed Jeannette Dowinton from Chester this morning as its one-millionth customer. Councillor Samantha Dixon, Leader of Cheshire West and Chester Council presented a prize of £250 Market vouchers and a bouquet of flowers from the Flower Lounge in the Market. The count started from when footfall counters were installed at the end of last year, the Market team were watching the counters throughout the week before the balloons were put out on Friday morning. Councillor Dixon said: “This is a real landmark for the Market. Over the past year there has been a transformation, the market has reached full capacity with new stalls and a fantastic food area. There are now later openings on Fridays and the market has made the top ten shortlist for the best market in the country competition as voted by shoppers”. “The market will be at the centre of the first phase of the Northgate development with a new building on Market Square below a new Picturehouse cinema”. A surprised Jeannette said: “I can’t believe it, I never win anything. I like to support small businesses, Chester Market is quite iconic”. Chester Market has extended opening hours during the festive period for unique gifts, crafts, foods and treats. Thursdays 8am to 8pm and Fridays 8am to 8pm (except 28 December). Sundays 11am to 4pm (16 December and 23 December).